Junkfood Science: Loophole Part Two: The canary in the mine? Loophole Part Two: The canary in the mine? Should failings in the integrity of science and evidence-based clinical guidelines matter, regardless of the popularity of their proposals? Or, do we look the other way because we don’t want to appear to be endorsing politically incorrect unhealthy behaviors? Do the ends ever justify the means if it’s at the expense of science or lives? How would you feel upon learning that an expert panel that had written clinical care guidelines issued by the Department of Health and Human Services had been commissioned and funded by a group which held the bulk of shares in the pharmaceutical companies whose products it had recommended as mandatory first-line treatment for all patients with this condition, and that the chairman and most of the hand-selected members of this expert panel had extensive financial interests with those same companies? Do you feel it’s okay for clinical guidelines to be written by those who stand to benefit from their own recommendations? Or, do you feel that such financial connections should at least be disclosed? How would you feel to further learn that the research and efficacy of the drug advised by this panel had been called into question by other medical professionals, had been linked to more adverse events than any other drug, and that the FDA had even issued public health advisories because of severe adverse effects with the drug? Would you still feel that you could trust the objectivity of these experts and their interpretation of the evidence? As a healthcare professional, would you want to be in the position of having to follow those clinical guidelines? As has been repeatedly said by those behind the war on obesity, it would be tackled just like smoking by convincing the public that it is such a threat to society and so repulsive that the tiniest exposure is dangerous and intolerable. (We’ve moved from the era of Fred Astair to now hearing statements that even a brief whiff of second-hand smoke causes permanent heart disease. The soundest science is probably in between, given that the fundamental principle of toxicology is ‘the dose makes the poison.’) As the Washington Post wrote last week in the article, “Like smoking, like obesity,” the strategies used in the campaign against smoking could serve as a blueprint for anti-obesity initiatives. Of course, no medical professional would recommend most people take up smoking for their health. That’s not what this situation is about. Smoking has come to be seen so negatively, though, that surprisingly little attention or concern has been given to conflicts of interest behind the clinical care guidelines for tobacco use issued by the HHS, even as it appears people are being hurt. Regardless of what you may personally believe about smoking, improper science and conflicts of interest, and a system that encourages and allows such breaches, should concern all of us... as we could be next. On February 1st, the FDA issued a formal Public Health Advisory and a Medwatch alert, warning consumers and healthcare professionals about safety concerns with this drug, which it updated on May 16th. By the end of the following week, the Federal Motor Carrier Safety Administrations had banned commercial driving licenses for anyone on Chantix and the Los Angeles Times published an investigative story on Chantix linked to dozens of highway traffic accidents. 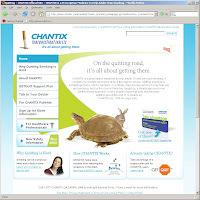 It profiled perfectly healthy people suddenly having seizures, losing consciousness and running their cars off the road (including a young man with his girlfriend and baby who found themselves in a murky river); and reported thousands of serious reactions involving Chantix had been reported to the FDA, including suicides. Lois Biener, a researcher of tobacco use and control efforts at the University of Massachusetts in Boston, said most people who quit do so without smoking-cessation drugs. There's little evidence that these drugs are superior in the long run to quitting without help, and while a few studies have shown some benefit, it's “way less than what is claimed” by medication advocates, Biener said. Yet, despite even the FDA communications and numerous medical concerns raised in the medical community since last year, the HHS just issued the new smoking cessation Clinical Practice Guidelines, “Treating Tobacco Use and Dependence, 2008 Update” ... which specifically recommends Chantix. The guidelines also note that in 1997, only 25% of managed care health plans covered tobacco dependence treatment, but 90% offered coverage by 2003, adding weight to the impact of these guidelines. This provides extra incentives for recommending covered treatments. While having experts writing clinical care guidelines who also have connections with the very drug companies whose products they are recommending is disturbing, regardless of the health issue, if we stop here, we miss even more serious issues raised in this incident: that greater potential influences come from nonprofits. RWJF isn’t just the largest funder of anti-obesity programs and legislation efforts, but anti-tobacco, too. Yet, being a foundation, it’s not only exempt from taxes, it doesn’t have to file disclosure reports required of other lobbying organizations. Going down the list of members on the 2008 expert panel that developed the tobacco clinical guidelines, finds 15 members with extensive ties and funding from RWJF, including a number serving on a variety of RWJF programs such as Prescribe for Health (advances behavioral counseling interventions for tobacco cessation and obesity), Addressing Tobacco in Managed Care (working to get smoking cessation products and interventions covered by healthplans), Smoke-free Families, and its Smoking Cessation Leadership Center. To get an idea of the significance of these ties, Susan Curry, for example, is director of smoking cessation programs at the University of Illinois in Chicago which has received active grants from RWJF of $2,996,867 in 2005-2008 and $1,240.783 for 2007-2009. Her university program was also awarded an $8 million, 4-year grant from RWJF in 2003 for a smoking cessation program. She’s also served on the Board of the American Legacy Foundation (a lead agency for the 2008 guidelines) which received a $720,000 grant from RWJF for smoking cessation programs. According to the University of Wisconsin’s website, Dr. Fiore founded and has served as director of the University of Wisconsin Center for Tobacco Research and Intervention (UW-CTRI) since it was established in 1992. He is also co-director of the RWJF national program, Addressing Tobacco in Managed care. In 2003, RWJF awarded UW-CTRI, with Fiore as project director, $300,000 to translate tobacco dependence research into policy. Another $400,000 was granted in 2005 to evaluate a national quit line. RWJF granted another $400,000 from 2005 through July 2008 to build a network to fund tobacco-related research. In September, 2007, RWJF granted $99,316 to increase Medicaid recipient demand for tobacco dependence treatment. And in December 2007, Dr. Fiore and UW-CTRI was granted $100,000 to update, test and disseminate the 2008 tobacco clinical guideline. Yet, he and the other panelists didn’t see this money as a conflict and didn’t recuse themselves from serving on the clinical guidelines panel. But, there are not required to even disclose these financial interests. We are so quick to condemn ties to pharmaceutical companies, but when even stronger financial connections and potential influences come through a foundation or nonprofit professional organization tied to a pharmaceutical company, those go unquestioned. This leaves open any pharmaceutical company or special interest to be able to buy influence and weaken the integrity of science and medicine simply by setting up a nonprofit or working through one. You may not think that this example has influenced the public messaging about the deadliness of cigarettes or that this applies to you. But it does. It illustrates that the groundwork has been laid to make it possible for stakeholders to influence clinical practice guidelines for obesity and other preventive health measures, as well as the public policies that follow. If you feel that financial disclosures are important for helping to preserve the integrity of science and evidence-based medicine and public health policies, then financial disclosure statements should include all moneys, including those from nonprofits. Michael C. Fiore has served as a consultant for, given lectures sponsored by, or has conducted research sponsored by Ciba-Geigy, SmithKline Beecham, Lederle Laboratories, McNeil, Elan Pharmaceutical, and Glaxo Wellcome. William C. Bailey has served as a consultant for, given lectures sponsored by, or has conducted research sponsored by Glaxo Wellcome, SmithKline Beecham, Schering-Plough, 3M Pharmaceuticals, Pfizer, and Sepracor. Stuart J. Cohen has not served as a consultant for, given lectures sponsored by, or conducted research sponsored by any pharmaceutical company. Sally Faith Dorfman has served as a consultant for, given lectures sponsored by, or has conducted research sponsored by various pharmaceutical companies. Michael G. Goldstein, in addition to being an employee of the Bayer Corporation, has served as a consultant for, given lectures sponsored by, or has conducted research sponsored by Glaxo Wellcome, McNeil, Ciba-Geigy, SmithKline Beecham, Boehringer Ingelheim, Sano Corporation, Dupont Pharmaceuticals, and Eli Lilly. Ellen R. Gritz has served as a consultant for, given lectures sponsored by, or has conducted research sponsored by Bristol Myers Squibb, SmithKline Beecham, and Glaxo Wellcome. Richard B. Heyman has not served as a consultant for, given lectures sponsored by, or conducted research sponsored by any pharmaceutical company. Carlos Roberto Jaén has served as a consultant for, given lectures sponsored by, or has conducted research sponsored by Glaxo Wellcome Pharmaceuticals. Thomas E. Kottke has served as a consultant for, given lectures sponsored by, or has conducted research sponsored by McNeil Consumer Healthcare. Harry A. Lando has served as a consultant for, given lectures sponsored by, or has conducted research sponsored by Glaxo Wellcome and SmithKline Beecham. Robert Mecklenburg has served as a consultant for, given lectures sponsored by, or has conducted research sponsored by SmithKline Beecham and GlaxoWellcome. Patricia Dolan Mullen has not served as a consultant for, given lectures sponsored by, or has conducted research sponsored by any pharmaceutical companies. Louise M. Nett has not served as a consultant for, given lectures sponsored by, or conducted research sponsored by any pharmaceutical company. Lawrence Robinson has not served as a consultant for, given lectures sponsored by, or conducted research sponsored by any pharmaceutical company. Maxine L. Stitzer has served as a consultant for, given lectures sponsored by, or has conducted research sponsored by McNeil and SmithKline Beecham. Anthony C. Tommasello has not served as a consultant for, given lectures sponsored by, or conducted research sponsored by any pharmaceutical company. Louise Villejo has served as a consultant for, given lectures sponsored by, or has conducted research sponsored by Ortho Biotech. Mary Ellen Wewers has not served as a consultant for, given lectures sponsored by, or conducted research sponsored by any pharmaceutical company. Timothy Baker has served as a consultant for, given lectures sponsored by, or has conducted research sponsored by Elan Pharmaceutical, SmithKline Beecham, Glaxo Wellcome, and Lederle. Victor Hasselblad has served as a consultant for, given lectures sponsored by, or has conducted research sponsored by CorTheraputics, Skinceuticals, Merck, Novartis, AstraZeneca, AstraCharnwood, The Medicines, Pfizer, Daiichi, Hoffman-LaRoche, RhonePolenc Rorer, Alexion, SmithKline Beecham, Dade, Quad-C, and Centocor Lilly. Marc Manley has not served as a consultant for, given lectures sponsored by, or conducted research sponsored by any pharmaceutical company. David L. Schriger has served as a consultant for, given lectures sponsored by, or has conducted research sponsored by Pfizer Corporation and the MedAmerica Corporation. David W. Wetter has not served as a consultant for, given lectures sponsored by, or conducted research sponsored by any pharmaceutical company.